This was a beautiful package to use. It was easy to install and everything just worked the way we expected it to. 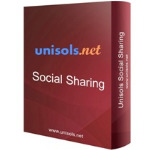 I recommend this module for social sharing within your website. Awesome price and easy to use. Very useful module. Simple and straight to what you need. Alan's Simple Articles is a great solution for us. We were using the Announcements module to display new articles on the home page. Unfortunately, when the articles expired and dropped off the home page, only authenticated (logged in) users could see the expired articles. The Simple Articles module solves this for us wonderfully! It's easy to setup and use. We're using the Template-based view which is very customizable. Finally, Alan has been super helpful at every turn. Personally answering any questions we had. If you're looking for a simple solution for managing news on your website, this is it! I checked out a lot of products, and many were good, but they were too complicated for my customer's needs. All I really needed was an easy to understand interface, so that anyone (including those with zero knowledge of HTML or DNN) could quickly add articles, a photo, and link to a document. And that's what I got! This module is simple enough so that it's easy to learn, but powerful enough that it doesn't feel restrictive. I highly recommend it if you're needs are similar to mine. Functions as it should and as demonstrated. Very punctual and helpful tech support. A bargain for a simple module to post news items and the like. from good documentation to great (and timely) customer service; it does not get any better than this. highly recommended. Highly recommended. Great module for a small prize. It's simple to use and powerfull enough to suit a lot of needs. Also I've asked Alan to make a change to improve the list view and he had develop it very quickly and for free. Thank you again Alan! This module does exactly what it says and is able to be customized to fit your needs with css. I asked Alan for some further customization and he was extremely quick to respond and delivered an exceptional package that did exactly what I asked. I highly recommend this module and will look forward to anything else that Alan publishes! !